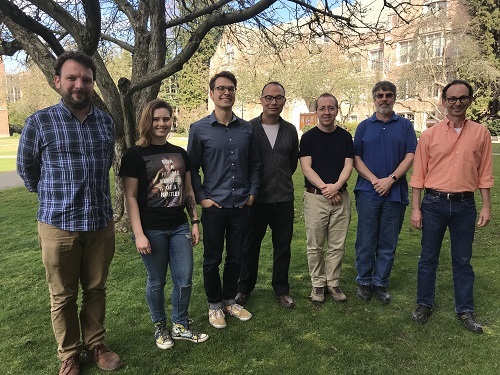 The paper's A&A authors (L-R): Anton Stepanov, Ellie Forbes, Elliot Claveau, Yue Zhang, Toby Weber, Brian Nelson, and Uri Shumlak. Nuclear fusion powers the stars and offers the promise of unlimited, clean energy on Earth. But controlled thermonuclear fusion in the lab usually requires large and expensive magnetic field coils to stably confine burning plasma, ionized nuclei that collide to initiate nuclear fusion. 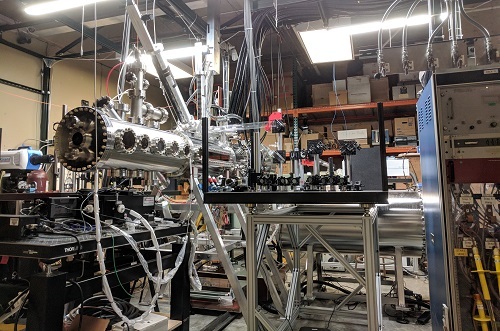 A&A's Fusion Z-Pinch Experiments (FuZE) Lab has demonstrated a smaller, cheaper method: We have measured sustained nuclear fusion for the first time from a 50-cm long plasma column called a Z-pinch. This method compresses a flowing plasma using electromagnetic forces, which drive the plasma to higher temperatures and densities. The Z-pinch in A&A's FuZE Lab. Our paper, Sustained Neutron Production from a Sheared-Flow Stabilized Z Pinch, has been published in Physical Review Letters. Katherine Wright, Senior Editor of Physics, published a summary of the paper: Synopsis: Igniting Fusion in the Lab. Nick Lavars of New Atlas covers this research in Nuclear fusion breakthrough breathes life into the overlooked Z-pinch approach.